US59 north was Houston's second freeway to be constructed, after the Gulf Freeway (IH-45 south) which had its first section open in 1948. Initial sections of the Eastex freeway north of downtown were opened in 1953, and most of the freeway was built in the 1950's. Like most 1950's era freeways, US59 north was small and very poorly designed. In fact, it had only six main lanes inside Loop 610, and only 4 main lanes north of Loop 610. Right-of-way width was generally less than 300 (91m) feet wide. Well, the old Eastex freeway is now gone, replaced with magnificent wide and modern facility. The right-of-way was expanded by at least 100 feet throughout the corridor, providing a right-of-way width that is typically 350 feet (107m) wide or more. Construction began around 1991, and after long delays, was completed in Houston by the late 1990's. Some sections took 7 years to construct, causing local controversy as detailed in this Houston Chronicle article from July 1995. Construction is still in progress on the far north end, and more expansion is planned on segments further north. The new stretch of freeway generally has a minimum 10 main lanes, although there are 8 lane stretches as noted on the map. There is one reversible barrier-separated HOV lane in the center, but there is enough pavement available for 2 HOV lanes. 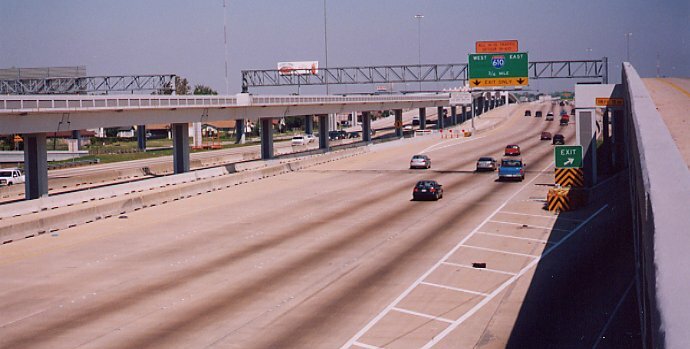 A Houston Chronicle article from August 15, 1999, profiled the Eastex freeway. First section of feeder roads north of downtown is constructed. The name "Eastex" freeway is selected by judges in a contest. 1950's Most of the freeway is originally constructed. 1969 Houston Intercontinental Airport (now Bush Intercontinenal) opens. 1991 The massive reconstruction and expansion begins. 1999 After long delays, the freeway is complete from just north of downtown to IAH airport. 2001 Construction is in progress north of FM1960, at Beltway 8, and at IH-10 near downtown. and add more direct connectors at the BW8 interchange. View of the freeway just north of downtown Houston, with the elevated HOV lane in the freeway center. This view looks north. Photo taken Fall 2000. The four-level stack at Loop 610 north. Originally constructed in the late 1970's, this interchange was modified and improved in the late 1990's. This view looks north. Photo taken September 30, 2000. US 59 just north of Loop 610. The HOV lane bypasses the US59/IH-610 interchange to the west, and here it rejoins US59. This view looks north. Photo taken September 30, 2000. A typical view of the freeway north of Loop 610. This segment of freeway has 10 continuous main lanes plus auxiliary merging lanes. This view looks north. Photo taken December 22, 2000. A typical view of the freeway north of Beltway 8 near Bush Intercontinental Airport. This segment of freeway has 10 continuous main lanes plus auxiliary merging lanes. This view looks north. Photo taken Fall 2000. Construction of the freeway expansion north of FM1960. Notice the two interwoven entrance/exit ramps. This view looks north. Photo taken Fall 2000. Construction of the piers of the elevated HOV lane ramp. Photo taken Fall 2000.